One of the main reasons for allergy happens to be the animal hair and dander. The hair and dander from the pets have a protein that can trigger allergic reactions in us. This can be difficult for those who love pets and at the same time have allergic reactions such as these. The BioAllers Animal Hair and Dander allergy relief liquid is the remedy for them. BioAllers Animal Hair and Dander is a homeopathic preparation that can reduce the common allergy symptoms such as sneezing, itching, rashes, congestion, watery eyes etc. The active ingredients are in dilute form but powerful enough to get you relief. bioAllers Animal Hair and Dander is a homeopathic preparation. It is a nondrowsy formulation that is safe to use by all and at any time. Not all allergy relief medications are fit to use during the day as they can make you sleepy. Here with bioAllers Animal Hair and Dander, there is no such problem. 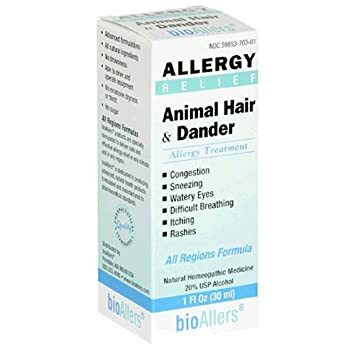 BioAllers Animal Hair and Dander is a homeopathic preparation that can reduce the common allergy symptoms such as sneezing, itching, rashes, congestion, watery eyes etc. It is safe to use by all and at any time. This formulation can relieve you of the allergic symptoms, temporarily. If you are allergic to pet dander and hair, you got to have this bottle handy, especially on vacations and paying a visit to a friend who has pets. This will keep you relieved and ‘normal’. Adrenalinum acts as a decongestant. It has an influence on the sympathetic nerve endings. Allium cepa is good to relieve the running nose and watery eyes. Arsenicum iodatum is useful in dealing with the general symptoms of allergic reaction. It can not only reduce the various symptoms but can also reduce the swellings that usually follows after a severe allergic reaction. Euphrasia officianlis can work on reducing the watery eyes and running nose. It has better effects on the eyes than dealing with the nasal discharge. Sabadilla is good to get rid of sneezing that does not seem to stop. Silicea is usually used for seasonal allergy. In case the pet dander carries the spores or pollens from outside and that is the reason for your allergy, this ingredient comes useful. Histaminum hydrochloricum is an anti-histamine that is effective for the itching, congestion, and asthma that follows due to pet allergy. Antigens from Cat, Cattle, Dog, Horse, and Sheep wool and they are diluted to 12X. these are to help you deal with the protein in the pet hair and dander. bioAllers Animal Hair and Dander Allergy Relief is in liquid form. The liquid is meant for sublingual administration. There are various capillaries under the tongue that can take the medication directly to the blood stream and can act faster. A bottle contains 1 oz liquid. The usage directions say that it is meant for all but the dosage is higher for adults and children who are above the age of 12. The recommended dosage is 15 drops of the liquid taken under the tongue. Keep the liquid there for a while until it is fully absorbed. It is not to be swallowed as it can slow down the effects. This must be repeated 2-3 times a day until there is any improvement. If the symptoms do not subside even after 4-5 days, it is better to consult the physician to seek further treatment. bioAllers Animal Hair and Dander should be used as a temporary relief method only. It is not an actual treatment. The dosage is for children who are 2-12 years of age can take 3-5 drops thrice a day. It is flexible to be reduced for people who are sensitive. They can take 1-3 drops and wait to see if they are ok with the remedy. If they are tolerable, they can continue with the usual dosage, but it is advised to start low and increase the dose only gradually each time. The precautionary measures needed while taking bioAllers Animal Hair and Dander is that it is not fit for pregnant women or lactating mothers. Caution is also called for those who are asthmatic with severe allergies. This formula can cure the mild allergies. Being a homeopathic preparation bioAllers Animal Hair and Dander does not have any major side effects. The possibility of any unwanted reaction is expected under circumstances of overdose. Never take more medication than that is recommended. It does not work faster if taken in more quantity. Sensitive people can have more allergies with this than having any relief. In that case, immediately stop using the product. Finally, just make sure that you store the product away from sunlight and is stored in a dark area. Jennie is a happy customer. She is a cat lover but her husband is allergic to pets. She got this homeopathic preparation and she got positive results within a month. Her husband can now comfortably sit with her pet with no allergic reactions. Alison says she got better immunity after taking bioAllers Animal Hair and Dander. She no longer suffers allergies during the night and can sleep through without any problems. Amanda managed to get rid of her cat allergy with just 2 bottles of bioAllers Animal Hair and Dander. She followed the directions and is happy that she bought this. She warns that it tastes real bad but it is worth the sufferings. Sharon uses bioAllers Animal Hair and Dander allergy relief liquid whenever she visits her friend who has a cat. She does not suffer the allergies after each visit. bioAllers Animal Hair and Dander uses natural ingredients that are curative and can also stimulate the immunity. This product can relieve the symptoms and also prepare the body for the next episode. Many have used it for relief ending up taking it for longer to have long-term positive effects. Within a month or 2, they are able to withstand the pet hair and dander than they could. Without the drowsy feeling, this can work better.